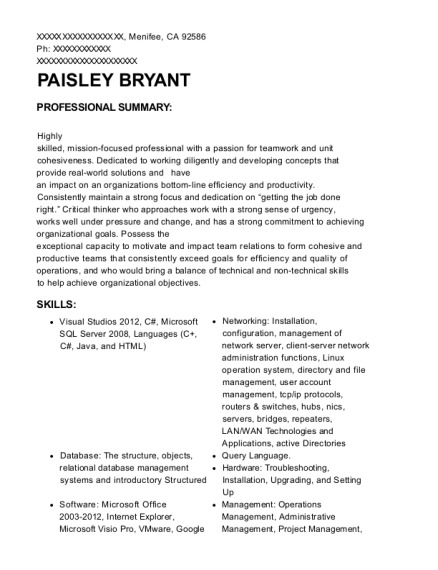 Results and goal-oriented Network Technician known as a consistent team player with skilled technical abilities. I am currently furthering my education to become a Network Engineer, and currently in the process of obtaining my CCNA Routing and Switching certification. Duties include maintenance and troubleshooting of cable plant and Cisco/Juniper network hardware. Update infrastructure documentation including as-built drawings. Installation of fiber paths for new hardware deployment. Aruba Wireless Management including access point provisioning add/remove, renaming and regrouping and troubleshooting. Special wireless projects for Aria Hotel and Casino including the upgrading of the wireless core. Configuration and code upgrading of enterprise switches and routers including Juniper EX and MX series, and Cisco 2960, 3560 and 3750 switches. Contractor for MGM Resorts International for Network Engineering. Perform duties as a network technician at multiple MGM properties located in Las Vegas, Nevada. Duties include maintenance of cable plant and Cisco and Juniper network hardware. Termination/testing of new cable installation and activation of switch ports for MGM corporate entities and employees. Troubleshoot network issues, including Aruba wireless access points. Contractor for Mobilitie in a joint project with Xerox Business Services to install wireless infrastructure for MGM Resorts International. Installation of Cisco Catalyst 4500 series layer 3 switches, Catalyst 3750 and 3560 switches at multiple MGM properties. Installation of wireless core and SAN at Switch Communications NAP 7. Inventory and deploy Cisco 3502 I/E/P wireless access points and antennas for installation by contractors. Troubleshoot access points after installation by contractors. Fluke AirMagnet testing at multiple MGM properties. Worked in conjunction with MGM Infrastructure and Architecture team. Hired as an installer for MGM's City Center project Aria Hotel and Casino in Las Vegas. Construction of ladder and rack/cabinet. Category 6 twisted pair cable, 25/50 pair copper cable, single/multimode fiber optic cable installation termination/Fluke DTX testing. Install 210 punchdown blocks for Siemon XLBET Frame in podium and tower telecommunication rooms. Security sound/video/audio cable installation for multiple Elevator equipment rooms. TeleData, Installation terminating/Fluke DTX Testing of Category 6 and single/multimode fiber optic cable for Terminal 3 at McCarran International Airport. Construct cellular site for, Cricket Wireless, Metro Pcs, Verizon, Clearwire, and Sprint/Nextel. Build to spec following detailed engineered plans, including grounding, hanging collars/t-arms, antennas, radios and microwave dishes. Construct, Ice Bridge, cable trays and h-frames. RET upgrade, and site change-outs. Install/terminate/weatherproof Andrew/Commscope coax cable including elliptical cable. Quality inspection and sweep test coax and antennas. Assigned to Smart City Networks at the Las Vegas Convention Center , as a phone and internet installer in preparation for the CES show in January of 2008. Utilizing punch down, and terminating tools for cat 5 and cat 3 cable. Assigned through Ledcore to pre-rack and terminate Cat-6 /110 patch panels for Limelight (Walt Disney Corp.) Duties included pathway design, cable dressing, installation of Optronics patch panels, cable management racks, and fiber optic management trays. Perform daily maintenance and upkeep of HFC facility in Pahrump Nevada. Duties include installation and troubleshoot residential and commercial accounts. Upgrade / rebuild, aerial, and underground construction. Splice and terminate 500/625/750/875 gauge coax and twisted pair cable. Install and maintain amplifiers, and line extenders, both Magnavox and Scientific Atlantic and Siecor brands. Cat-5 termination plus 66 / 110 punch down. Cisco Switch management, and server monitoring. Independent cable contractor for CMA Communications in Pahrump Nevada. Install digital,, broadband and VoIp. Troubleshoot and QA check prior installs. Train and test all new hires. Supervise up to 30 cable technicians. Liaison to Cox Contract Relations Team. Daily routing and equipment assignment. Manage supply and equipment ordering. Installation of analog, digital, broadband and VoIp cable services. Train and test new hire technicians. Commercial cable installation, E.M.T conduit bending, flex conduit pathway installation. Duties include, pigment manufacturing production operations for a leading color supplier in North America, and abroad. Sample batch spectrum color-match testing in a laboratory setting. Aided in the development of pigmented polyurethane, polyvinyl, and various co-polymer substrates. I performed as a lab technician for a manufacturer of flexible packaging for food/industrial applications. Duties included, design and development of packaging for Starbucks Coffee, and Scotts lawn products,. Pharmaceutical adjuncts, and resin applications. Performed daily tasks in a laboratory environment. Testing various materials using Newton, tensile, and COF methods. I aided in the redesign and modification of an existing one-way degassing valve, and I was recognized as contributing lead technician on the US patent. 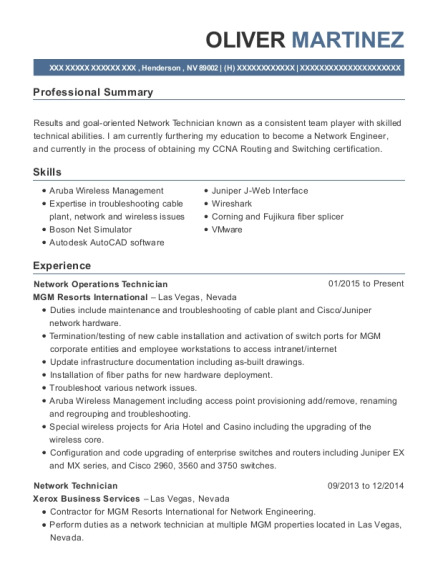 This is a resume for a Network Operations Technician in Henderson, Nevada with experience working for such companies as MGM Resorts International and Xerox Business Services. 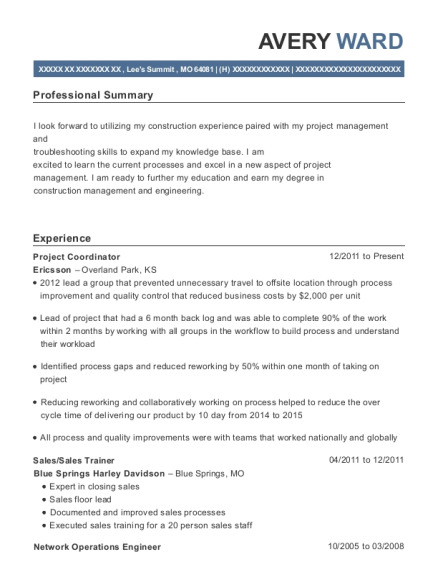 The grade for this resume is 0 and is one of hundreds of Network Operations Technician resumes available on our site for free. 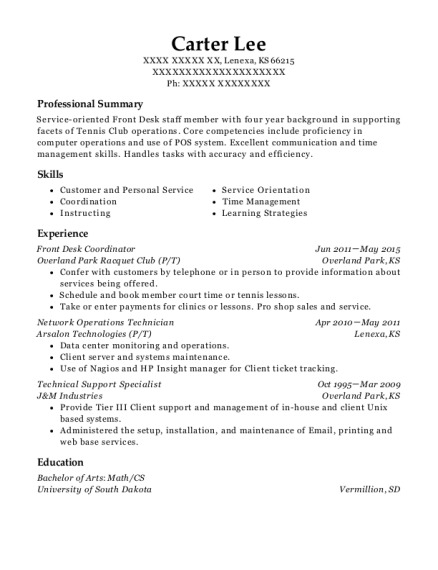 Use these resumes as templates to get help creating the best Network Operations Technician resume.